Mark Tolner tells of the two different aspects of Dubai, an evolving city. Until 2002 the area known as ‘New Dubai’ was mostly empty desert and would not exist were it not for the original city or ‘Old Dubai’ which is based around the creek. Mark Tolner goes on to say that New Dubai is what most people come to visit Dubai for; the big hotels, beaches, the famous Burj al Arab and large shopping malls, a new rail system opened in 2010 linking Dubai Marina, the airport and many residential and commercial neighbourhoods. 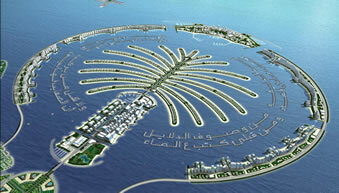 Not forgetting the world’s biggest man made islands, Palm Jumeirah aptly named due to its shape of a palm tree built using around 100 million cubic metres of rock and sand dredged from the bottom of the Persian Gulf. Now home to the beautiful Atlantis hotel also boasting its own shopping mall, monorail connecting you to mainland Dubai, world class restaurants and of course breathtaking beaches, many people are now living in the villas and apartments on the Palm Island. Mark Tolner admits that although Dubai has been hit by the global economic crisis, building is still going on, although it has slowed somewhat in recent years. Mark believes that when visiting Dubai you should decide which area you prefer to stay in, the Creek ‘Old Dubai’ is the traditional and oldest part. In the early 20th century the creek served as a minor port for dhows (boats) coming from India or East Africa and has remained an important part of establishing Dubai’s commercial position. Fishing was an important industry but it was the pearl trade that contributed the most to Dubai’s economy. The creek was eventually developed in 1955 to allow larger vessels to cross although with the development of the newer Jebel Ali port, Dubai Creek is less important. One recommendation from Mark Tolner is to take an Abra boat (Abra comes from the Arabic verb to cross) across the creek to visit the various spice and textile souks , the Abra stations are a hustle and bustle of people, locals and tourists and it’s a great way of viewing the creek and its traditional architecture from a different angle. It’s best to walk around and explore this magnificent part of Dubai at dusk or evening and if you go to the Deira side of the creek you will even see the traditional wooden dhows still trading with Iran and East Africa. On the Bur Dubai side you can visit museums a Heritage village and eat in some wonderful open air restaurants. It is bustling, individual and has its own sights, smells and sounds of calls to prayer. Now home to around 2 million people with new cities popping up everywhere. Many of these cities are commercial like Media City; others are residential with their own retail shops and restaurants. Mark Tolner mentions the world’s only 7 star Hotel, the Burj Al Arab as a must see in new Dubai, it’s in prime location next to Wild Wadi water park, the Jumeirah beach hotel and Madinat Jumeirah with its very own souk, traditional design and wonderful selection of restaurants and nightlife. There is a large public beach alongside the hotels here on Jumeirah, it is a really nice place to chill out and take photos. Another must see place is the Mall of the Emirates on Sheikh Zayed Road , home to ‘ski Dubai’ a man made ski resort offering skiing snowboarding and tobogganing.